Decode some of the mysteries of animal expression by interpreting your pet’s body language. Not everything your pet does is exactly what it seems to the human eye! 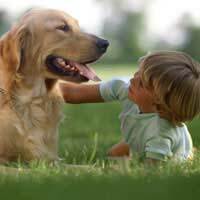 The section on dogs is an excellent one to go over with kids because it can help prevent dog bites from strange animals as well as incidents in the home. A relaxed, happy cat rolls onto her back when she sees her owner, belly up in an open invitation to pet. Slow blinks, half closed eyes, kneading paws and deep purrs are all signs she’s feeling content and at ease. Her ears will be perked up and so will her tail, she may rub your face or her body along your legs. If her ears are down and back against her head, her tail bushed up or swishing from side to side rapidly, her back arched or her eyes are wide, look out! She’s angry or agitated. A long stare is also an indication of feeling put out. If her tail is held low between her legs, she’s simply unhappy or not feeling well. If her ears are down sideways instead of straight back, she’s trying to figure out what’s happening. Licking lips rapidly is a sign of being uncomfortable or ill at ease, as is the very tip of the tail twitching back and forth. When rabbits lower their chins to the ground and extend their heads forward, this is a request to be pet on the forehead. Nuzzling and licking are signs of affection, tooth grinding (it looks like your pet is chewing on something) is a way to express happiness, as is hopping, leaping and jumping around. Lying on their sides with their legs stretched out means that they are relaxed and at ease. Huddling low to the ground with ears pressed back is a sign of fear, especially if your rabbit’s eyes look wide and bulging. Thumping is another way to tell if your rabbit is afraid. Running in circles means your rabbit wants you to play. Jumping, nose sniffing, stretching and gurgling are all ways your guinea pig is saying he’s happy. An extended head and stretched out body means your guinea pig is getting nervous or thinks danger is approaching, also if he pulls his legs up under his body. If he proceeds to turn rigid, he’s playing dead and is quite scared. Rump sniffing means a mating session is about to start, better separate these two if you don’t want more babies! Both gerbils and hamsters jump around their cages, burrow in their litter, and groom themselves thoroughly when they are feeling happy. If your hamster has puffed up cheeks, exposed teeth or laid back ears, is walking stiff legged or rolls onto her back and shows her teeth, you better leave her alone for she’s not in a good mood right now. Gerbils rise up on their back feet and put their paws together if they are feeling scared or defensive, but will simply rise up without the paw gesture if they are merely curious. If you see a gerbil lick the sides of the cage, check the water bottle to make sure it’s not empty. If your gerbil pushes your hand away with her head, that means she wants to be left alone. Now see if you can practice some interpretations of your pet’s body language!